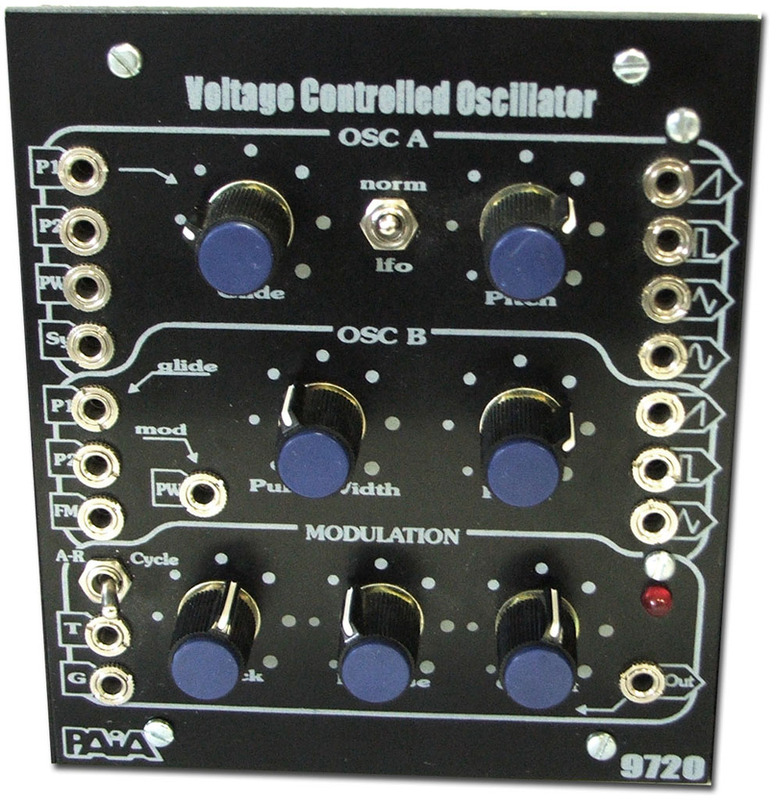 The 9720 Dual VCO w/Modulator features two independent VCOs, each with a chromatic range of 10 octaves from 16Hz to 16kHz at a +/- 1cent pitch error. Total range of each oscillator is from 1 cycle/minute (0.017 Hz) to 100 kHz so both can be used as wide range pitch sources convering the extending well beyond or super slow multi-waveform LFOs. Temperature stability is extraordinary due to a novel exponential converter that provides more accurate temp tracking than conventional designs. More details and tech analysis in the "9700 Series FAQ". Each VCO has two 1 V/Oct Control Voltage summing inputs and Pitch knob with 3 octave transpose range.. All outputs are DC coupled 5V p-p (-2.5V to +2.5V). The VCOs are identical in performance but there are subtle difference in features that optimize the flexibility of the pair. Osc A has Ramp, Pulse, Triangle and Sine waveforms outputs. A built-in Glide Processor provides slew rates from milliseconds (perceptually instantaneous) to several seconds. Glide is also normalized to Osc B allowing both oscillators to track a single CV at variable slew rates with no additional patch cords. A convenient toggle switch transposes OscA down from normal audio outputs to an LFO mode in which the Pitch knob controls a range from 0.017Hz to 50Hz. Pulse output width is voltage controllable and defaults to a high harmonic output of ~10% DF. A "soft" Sync input allows more complex timbres than unsync'd waveforms provide. Oscillator B has Ramp, Triangle and Pulse waveforms ouputs. Pulse Width is controlled both by the PW input and the Width knob. The PW input is normalized to the Modulator output so the useful effect of dynamic Pulse Width Modulation -either by transient or LFO - can be realized with no patch cords. An auxiliary 1 V/kHz Frequency Modulation input allows for complex FM timbres. The Modulator is an Attack/Release Envelope Generator that has a separate Trigger input for A/R envelopes and Gate input for A/R with Sustain (ASR). Attack time is from 0.5ms to 2 seconds, Release time from 1ms to 4 seconds. The Cycle switch allows self-triggering for an LFO with independently adjustable rise and fall times and a range from a cycle every few seconds to over 100Hz. Gate and Trigger inputs work in Cycle mode to sync and control the LFO function. The front panel LED brightens and dims to indicate Modulator output. The illustration shows a block diagram of the 9720. Oscillator A's Pitch CV1 routes through the Glide processor. The glide output normals to Pitch VC1 of the B oscillator so that only a single patch cord is needed for a tracking oscillators w/glide configuration. 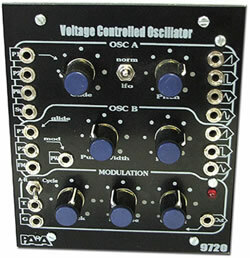 Plugging into Osc B Pitch CV1 disables the normal patch for independent control of the oscillators. The Pulse Width input of Osc B normals to the A/R Modulator's output. Careful attention to power and signal ground separation and local voltage regulation minimize parasitic interactions, such as pitch locking and cross modulations, that can occur with multiple oscillators. The module requires a nominal 18V bipolar supply which need not be regulated. Systems that include a 9700 midi2cv8 MIDI>CV can use it as a module power source or the 9770U power supply is available. The 9720K Dual VCO Electronics Kit includes all electronic parts, circuit board, switch, controls and knobs. Does not include panel or jacks. Need the case? Order the Frac Rak Accessory kit.